The larger dining area of Zark’s Burgers in SM North EDSA is outside their small store – in the middle of the corridors. Yet, lines are always long. We were curious about what makes Zark’s Burgers tick so we decided to try it out. One side of their menu is devoted to their burgers. The Minor League burgers are made of 1/4 pound patties. They have a variety of toppings which are quite unique. The Major League burgers are the fanciers ones, and some of them are half-pounders. My husband ordered the Zark’s Ultimate Burger (“1/4 pound burger with cheese sauce in a bed of fresh veggies and then topped with sauteed mushroom and bacon!”), I had the Philly Cheesesteak Burger (“1/4 pound burger topped with chopped onion, sirloin strips, and cheese sauce” – although I had the onions removed) and our daughter had the King James’ Tomahawk (“Classic! Cheeseburger with lettuce and tomato”). For dessert, we had the Deep-fried Snickers a la Mode. Photos of our orders are in the collage below, counter-clockwise from the top right photo. The burgers were huge and delicious! Not as juicy as those in The Burger Joint, but still good. Some of the sirloin strips in my burger were tough. Next time, I’ll get something with bacon instead. I was amazed that most of the diners ordered the bigger burgers – the half-pounders with so many toppings. The dessert was delicious too. I liked the gooey-ness of the softened candy bar inside the warm fried covering. The food in Zark’s Burgers is reasonably priced. There were a lot of students eating while we were there. 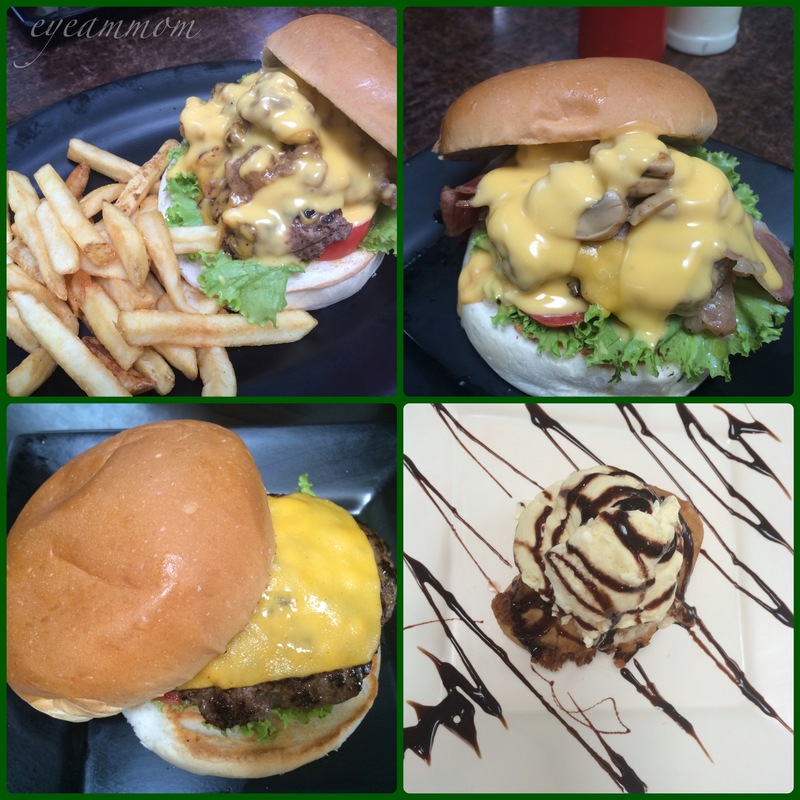 For serious burger lovers (or those who have big appetites), head on to Zark’s Burgers for your next burger binge. 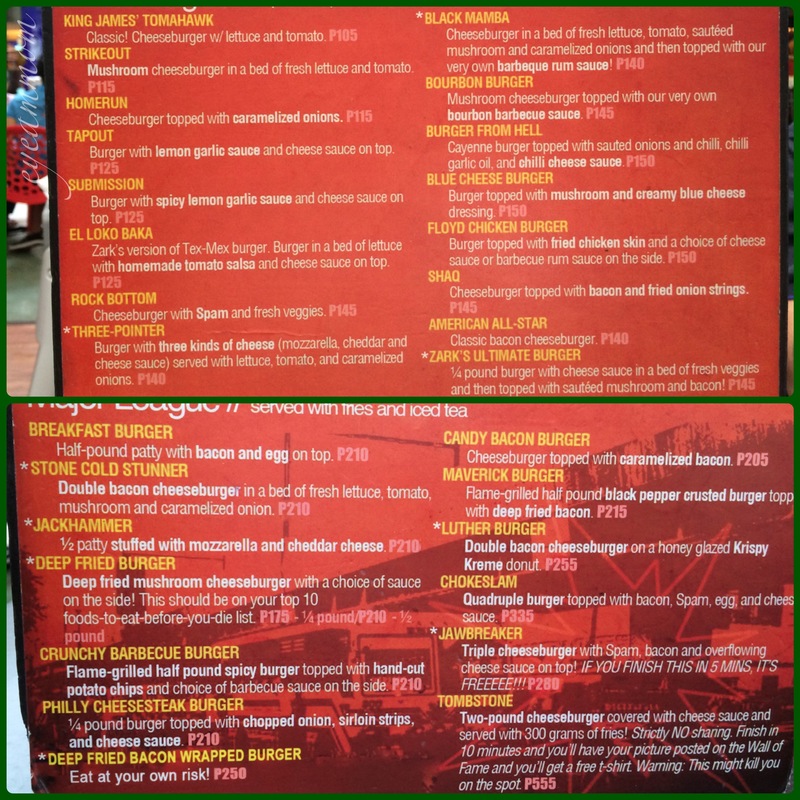 This entry was posted in Food, Life in the Metro and tagged burger, SM North EDSA, Zark's Burgers. Bookmark the permalink.